Accreditation helps health care organizations improve their performance for the benefit of their clients and the health system. It is public recognition by a health care accreditation body of the achievement of accreditation standards by a health care organisation, demonstrated through an independent external survey of that organisation’s level of performance in relation to the standards. AACI has developed standards for hospitals and other healthcare organizations, addressing key areas of organizational performance. Our standards have always been created by the people who use them. AACI has been involved in the development of standards for a range of healthcare facilities for over ten years. A Standard Development Committee composed of experienced physicians and healthcare managers guides the development process of the AACI standards. These standards are the basis of our accreditation services, providing a clear road-map for healthcare staff and delivering confidence to all stakeholders, including patients, board members, insurers and regulatory agencies.Information and experience related to the standards will be gathered on an ongoing basis. If a standard no longer reflects contemporary healthcare practice, commonly available technology, quality management practices, and so forth, it will be revised or deleted. It is currently anticipated that the standards will be revised and published at least every four years. Additionally, AACI offers the unique service of a virtually immediate response to any question involving our standards or their interpretation. It is our purpose to make flexibility possible for your unique needs and maintain compliance with CMS, WHO and other nationally and internationally recognized requirements. AACI is the only accreditation body to combine the Medicare Conditions of Participation with the management system standards including risk management consultation into a unified accreditation program. We have merged clinical requirements with some of the most recognized management standards in the world: ISO 9001, ISO 27001 and ISO 31000. But our standard reaches beyond that. Requirements including Ethical Practices and Information Security System challenges that modern healthcare organisations are facing today, are included in our accreditation portfolio. Periodical revision of the standards, in reality, is an ongoing process. It is supported by current customers, patient groups, relevant surveyors, healthcare group leaders, sales staff, and any other relevant external experts. Additionally, the evolution of national and international standards, rules and regulation, and advisory body guidelines are updated and included. The AACI Standards will undergo a major revision every 4 years. If a standard no longer reflects contemporary healthcare practice, commonly available technology, quality management practices, similar, it will be revised or deleted.During the process of revision input shall be sought from current customers, patient groups, AACI surveyors and sales staff, and any other relevant external experts. Minor revisions can be initiated at any time but these shall be used only to clarify requirements or correct errors and not to introduce new requirements into the Standards. Additionally, AACI offers the unique service of a virtually immediate response to any question involving our standards or their interpretation. AACI shall continue to evolve our standard as interested parties specify improvements, corrections are required, and influencing conditions change. AACI welcomes your advice as well. Please submit written comments, suggestions and remarks to AACI accordingly. Major revision of the standards shall be run as projects with a project plan developed prior to initiation where timelines and required resources are identified. A first draft shall be developed by the Standard Development Committee based on input that has been gathered over the period since the previous revision from surveyors and customers. The first draft document shall be circulated to internal experts. A second draft is then prepared based on the input received and this is reviewed by AACI experts. A second draft is than circulated to stakeholders and external organisations. A third draft will then be prepared based on the stakeholder feedback. The third draft is used for piloting with at least one healthcare organisation. The piloting involves reviewing the new document in a face to face meeting and identifying areas that are unclear and checking that the new requirements are reasonable and achievable. Finally, the new revision needs to be approved the Advisory Standard Committee and forwarded to the CEO for ratification before it is distributed to stakeholders. What does really make us different is our surveyors. They have been recruited and trained in line with AACI standards and guidelines.The role of the survey team is to validate the organisation’s system and not to inspect it or search for the nonconformities. Our accreditation program is disciplined and collegial. During this time our surveyors work closely with your staff to assess the current state of the organisation’s clinical workflow, documentation and management processes. Our goal is to see what’s working and what needs to improve. World renown experts in medicine, patient safety, and quality management will make every survey a collaborative journey to improvement. In a brief: We know healthcare! 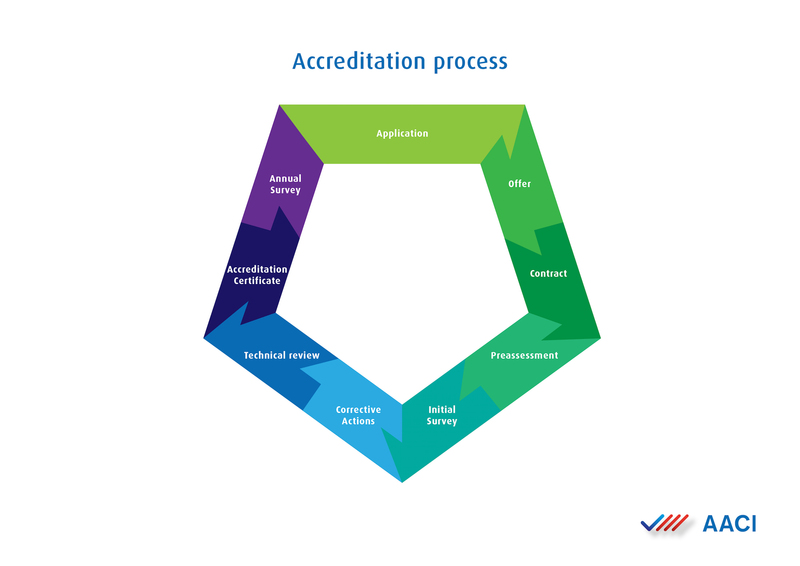 How to become an accredited healthcare organisation?